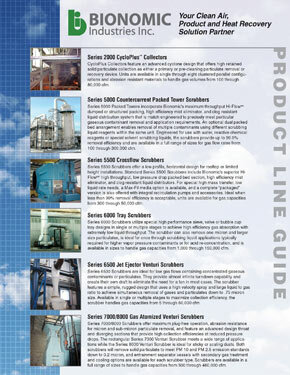 Bionomic Industries, Inc., an industry leading manufacturer of proven air pollution abatement, product and heat recovery technologies is now offering a newly updated and expanded version of their comprehensive product guide. The all encompassing 4 color guide includes descriptions, capacities and use for the full range of Bionomic's wet scrubbers, dry collectors, electrostatic precipitator devices, NOx control chemistry, re-concentration/by-product production and waste heat recovery systems and accessories. All backed by over 30 years of applications expertise in all industries. Also featured are many specialty and proprietary products and fully engineered, packaged systems not found from other manufacturers including: ScrubPac(TM) custom skid mounted, packaged process scrubber systems; ProClean(TM) integrated scrubber systems; RotaBed(R) fluidized bed scrubber; HEI(TM) high energy ionization wet electrostatic precipitator; BIONOxSOLVER(TM); NOx scrubbing solution; Product Reconcentration/Recovery systems; VentClean(TM) for storage tank and offloading operations; B-Tip(TM) biological device; HI-T Scrub(TM) quench/scrubber system; BFCS(TM) Bionomic forced condensation scrubbing system; ScrubSeal(TM) vacuum overflow valves; and Q-Sense(TM) direct contact heat exchangers for waste heat recovery. Each product or system is individually engineered to meet the most demanding customer application, performance, and budget needs.